Marilyn J. Beattie, 93, of Bowling Green, Ohio passed away October 27, 2018. She was born September 10, 1925 in Findlay, Ohio to Dr. Clayton and Ethel (Biddle) Shuck. She married Dr. Robert S. Beattie on June 13, 1947 and they enjoyed fifty-nine years of marriage until his death in 2006. Marilyn was a 1943 graduate of Findlay High School and she obtained her bachelor’s degree from Otterbein College in 1947 where she was crowned homecoming queen her sophomore year and selected for the women’s athletic honorary her junior year. 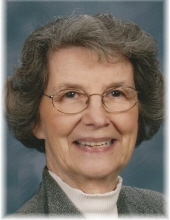 Marilyn was a 56 year member of First Presbyterian Church in Bowling Green where she served as an elder and trustee and was past president of the Presbyterian Women. She was a former member and past president of the Wood County Hospital Guild, former member and past president of P.E.O. Sisterhood Chapter AA and the first chairperson and longtime volunteer for Wheeled Meals in Wood County. She was a breast cancer survivor and was active in the Reach to Recovery program to support other women. Marilyn received the Bowling Green Outstanding Citizen Award in 1981. In addition to volunteering, Marilyn’s interests also included gardening, cooking and reading. She enjoyed attending her children’s and grandchildren’s numerous activities over the years. Marilyn was devoted to her family, church, friends and community and she will be remembered for her exceptionally kind spirit. Marilyn was also preceded in death by her son Steven, brother Dr. Emerson Shuck and sister Ruthanna Robertson. She is survived by her sons Dr. Thomas (Elizabeth) Beattie of Newark, Ohio, Daniel (Kathy) Beattie of Bowling Green, Ohio and David (Quin) Beattie of Dublin, California; grandchildren Emily (Darren) Demaree, Laura (Karl) Kornides and John Beattie; Hallie Beattie, Max Beattie and Molly Beattie; Spencer Beattie and Alexis Beattie; and great-grandchildren Isabelle, Thomas and Kathryn Demaree and Nila Kornides. Marilyn’s family is grateful to the staff of Brookdale Senior Living and Clare Bridge Memory Care for their many years of compassionate care. Visitation will be held on Friday November 2, 2018 from 4:00 to 7:00 p.m. at Dunn Funeral Home, located in the Historical District of Bowling Green at 408 West Wooster St. Her funeral service will be held on Saturday November 3, 2018 at 11:00 a.m. at First Presbyterian Church, 126 S. Church St. Bowling Green, Ohio 43402. Rev. Mary Jane Saunders will officiate. Interment will immediately follow the service at Oak Grove Cemetery in Bowling Green. Memorial contributions may be given in Marilyn’s memory to the First Presbyterian Church. To send flowers or a remembrance gift to the family of Marilyn J. Beattie, please visit our Tribute Store. "Email Address" would like to share the life celebration of Marilyn J. Beattie. Click on the "link" to go to share a favorite memory or leave a condolence message for the family.